Larry Grossi of Grossi Fabrication provides some information about ag welding to a group of eighth graders for Ag Day on the EHS campus on Friday. 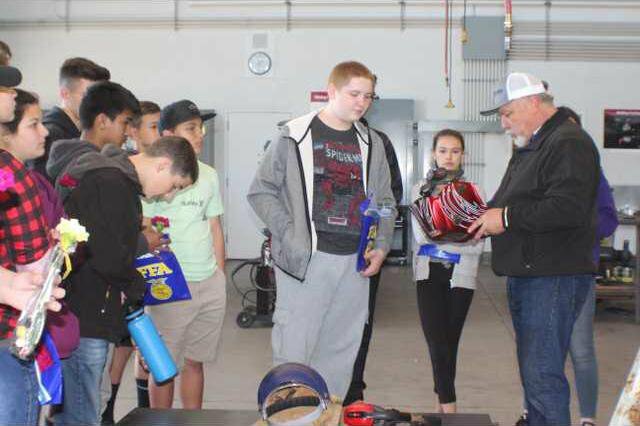 An estimated 160 eighth grade students from El Portal spent some time on the Escalon High School campus on Friday, learning more about the opportunities available to them in the agricultural industry. The Ag Day program, which had students rotating through several different stations, was hosted by the Escalon High School FFA and Ag Department, which brought in a variety of guest speakers. El Portal assistant principal Mike Gaston said the day offers students the chance to be on the high school campus, where they will be next year as freshmen, and get a taste of the ag life. “We’re exposing them to something they might not have thought about in terms of career paths,” he said. Freshman Alayna Azevedo had her goat ‘Travis’ with her to show visiting students and said FFA helps in many ways. “It’s going to benefit you in any career you go into,” she said of the practical skills membership in FFA provides. Senior Angelina Cordova served as a group leader and is in her first year with the local FFA group. “We just want the eighth graders to have a good experience and we want them to join FFA,” she said. Cordova enjoys animal science and hopes to pursue that as a career. Ag teacher Gypsy Stark said there were nine stations set up in the gym, with seven FFA judging teams and two community colleges represented, in addition to six industry presenters in the ag department representing animal science, plant science and mechanical. “Every student got to choose three,” Stark said of offering multiple options for eighth graders to investigate. They also were treated to lunch and got to take a plant home with them, along with a wealth of knowledge about the FFA program and potential career opportunities.